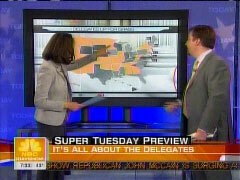 On the Monday "Today" show co-host Ann Curry was breaking down the delegate counts for each Super Tuesday state with NBC's political director Chuck Todd but when it came to finding Barack Obama's home state of Illinois on the map, Curry pointed to Minnesota instead. CURRY (pointing to Minnesota): --which is right here. CURRY (pointing to Illinois): No, wrong one. There we go.